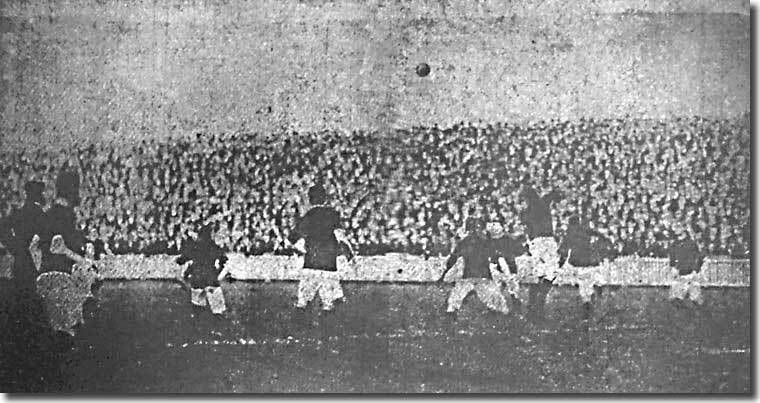 Leeds City's game with Burnley at Elland Road on 27 October 1906 was the most momentous in the club's short history to that time. It was memorable for the most tragic of reasons: the contest was marred by one of the earliest recorded deaths of a football player during a first-class match. City had just started getting their act together on the field after a pretty dismal opening run. Three victories on the bounce, their first of the season, had seen the team drag themselves up from 16th spot to 8th, seemingly ready to mount a genuine challenge for promotion from the Second Division after a promising debut season when they had finished sixth. Their Lancastrian visitors were level on points with City, but lay two places higher on goal average. A fourth win for the Peacocks would have seen them on the cusp of the promotion places. The Elland Road Selection Committee seemed to have finally settled on their best eleven after being heavily criticised by club supporters earlier in the season for continual chopping and changing - nine of the men who faced Burnley had figured in each of the three preceding games. The exceptions were former Plymouth Argyle left-back Andy Clark, returning after missing his first game of the campaign the week before (a 2-1 victory at Port Vale), and James Henderson, making his bow for the season in place of Jimmy Kennedy at left-half. There had been a heavy storm the previous evening, but the newly installed drainage system had done its job and left the turf in decent enough condition. Leeds City had the best of things in the first half and, according to the Yorkshire Post, "were almost incessantly attacking during the first half, and there was some remarkably clever football by the whole of the front line, though the Watson-Parnell wing was the most prominent. The final onslaught on the Burnley goal was never quite as deadly as the general plan of attack was fast and clever, and for this reason, as well as Green's cool goalkeeping, no substantial reward in points resulted. Wilson twice skimmed the bar with fast drives after receiving from his wings, but generally the luck was against the home side, and at the interval no points had been scored by either side." The Wilson in question was David 'Soldier' Wilson, a powerful and committed centre-forward of Scottish extraction, who had joined City from Hull the previous December for £150, ending up top scorer with 13 goals from his 15 appearances. He could have been sold at a quick profit but the City directors recognised his worth and refused to sanction a move, although they received several offers in excess of £500. A knee injury had restricted Wilson's appearances in the current campaign and he had yet to trouble the scorers. Wilson was struggling to recover his best form, but had done enough in the first half to signify that he could yet have an impact on the outcome of the game, even though he had been winded by a clash with two Burnley defenders and was not feeling fully himself. During the break "he expressed confidence that the team would just pull through". Challenges became more robust after the interval and, according to the Leeds Mercury, "some of the players were guilty of tactics which, to say the least, were of too vigorous a character. Lavery and Singleton were working nicely towards the Burnley goal when Lavery was tripped from behind, and fell heavily on his head. The little inside-left was stunned, and it was several minutes before he was brought round. The incident called for stern action by the referee, but that official only cautioned the offending Burnley player, when even Burnley officials on the stand were agreed that the culprit should have been sent off. Lavery was almost quite useless after this, so that Leeds were practically playing with ten men." Shortly after that, Wilson headed the ball goalwards and the effort seemed to cause some sort of injury, for around the hour mark he was forced to withdraw to the dressing rooms. He looked very pale and in great pain, telling the club trainer George Swift that "he felt a heavy pain in his chest" but that he had not "been charged or fouled in any way, and could only think he must have strained himself internally in jumping up to head the ball into the net". With Wilson absent and the indisposed Lavery little more than a passenger, Burnley started to get back into the game. Whittaker and Kenyon, the Lancashire team's right wing pairing, twice came close to breaking the deadlock, although City maintained their full share of the play. Things took a further turn for the worse when Harry Singleton also sustained an injury. He remained on the field for a while, but had to admit defeat and withdraw with fifteen minutes remaining after another stiff challenge. Singleton's exit was the catalyst for the day's tragic conclusion. Soldier Wilson was renowned for his bravery and commitment, and could not stand idly by when he heard the news that his team were virtually down to eight men. He screwed up his courage and decided to enter the fray once more, despite the stringent advice of club doctors and officials. The Yorkshire Evening Post: "Though his chest was very sore, Wilson said he could not remain there while the Leeds City team were in such straits. So, although many of those in the room endeavoured to dissuade him from his purpose he went out to resume play, his reappearance being greeted by a storm of cheers". It was quickly evident, however, that Wilson was neither use nor ornament and that he was in no fit state to continue for long. His return had been foolhardy in the extreme and, after three minutes and a single failed attempt to play the ball, he withdrew once more, clearly in the most extreme agony. There were only minutes left and still no score. 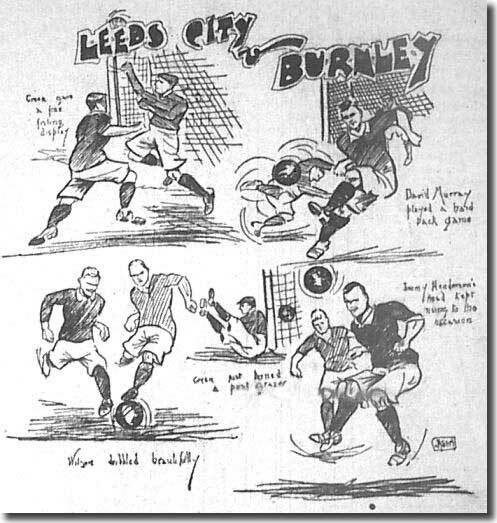 Even though they were in effect three men down and facing an uphill fight, it seemed that Leeds City would be able to hold out for the goalless draw that their pluck had merited as David Murray and goalkeeper Harry Bromage performed wonders in keeping the Lancastrians at bay. It was not to be, however, and in the closing seconds Bell, the Burnley inside-left, received the ball from a free kick and steered his shot beyond Bromage to settle the game. However, the result was of little import at Elland Road. A rumour of desperate tragedy was doing the rounds among the crowd, and a shock was waiting for the City players when they reached the dressing room - David Wilson had lost his life seconds before the end of the game. The sensational news spread around the city like wildfire. When Wilson had first left the field, police constable John Byrom, on duty at the players' gate, was so concerned at the player's demeanour that he followed him down to the dressing rooms. He found him writhing in evident pain on the ground with chest pains. The policeman summoned help, and was soon joined by three doctors, Dr Earnest Frederick Taylor, the City Club's physician, Dr Fawcett, who was sitting in the stand, and Dr Whittaker, the Burnley party's physician. Wilson was suffering intense pain in the chest, neck and left arm. He was carried into the directors' room, where Dr Taylor could find nothing definite to account for his condition, although he assumed that he had had a heart attack. Dr Taylor: "I thought he was far too ill to ever think of returning to the field." Eventually Wilson's condition started to stabilise and he felt a little better. His wife, who had been in the stand, had driven off in distress when Wilson had first been injured, and a cab was called to take him home. However, when Wilson heard of the injuries to the other players, even though his chest was still very painful, he insisted on going back out onto the field. The doctors and club officials tried to dissuade him, but Wilson would have none of it - he walked out of the room and returned to the fray. According to PC Byrom: "Five minutes later, he came off a second time. I assisted him to the dressing room, and helped him to undress. He said he would have a hot bath, but all at once after getting into the bath he laid down and started kicking his legs violently. I took hold of him and held his head out of the water, but he seemed to lose consciousness, and never spoke again." The officer, with the assistance of trainer George Swift, lifted Wilson out of the bath and placed him on a table, where, in spite of the immediate attention of Dr Taylor, he died within seconds. It was an immense shock to all present. Before the players left the dressing rooms Wilson had appeared to be in good health, and told the club's secretary-manager Gilbert Gillies that he felt perfectly fit. According to his wife, Wilson had never seriously complained of ill health, although once or twice during the past few weeks he had complained of being short of breath. Mrs Wilson suggested that her husband smoked too much: "He was a heavy smoker of cigarettes, and I kept telling him they were the cause." Wilson's body was taken by ambulance to the couple's house at 8 Catherine Grove, Beeston Hill and their relatives, who lived in Leith, were telegraphed, arriving the next day. On Tuesday morning a post mortem was held, together with an inquest, as reported by the Yorkshire Evening Post: "The inquest was held at the Imperial Hotel, Beeston, before the City Coroner (Mr J C Malcolm). There were present at the inquiry Messrs R Younger, Dimery, A Eagle and J Oliver (directors of the Leeds City Club), Mr Clayton (financial secretary) and Mr Gillies (the secretary and manager). Amongst those present were some of the deceased's relatives, including an uncle, who brought him up as a child, and a brother - a manly young fellow from the Black Watch, the deceased's old regiment, who, in his Highland uniform, was a sad auditor of the proceedings. "It was this same brother, by the by, who was in such a terrible state of anxiety and uncertainty yesterday, as to whether it really was his brother David who was dead. 'Is it David Wilson, late of the Hearts of Midlothian, who is killed?' he wired to Mr Gillies, but before Mr Gillies' reply reached him his suspicions had been confirmed, and he was on his way to Leeds." The inquest determined that it was "over eagerness to be of service to his club that was Wilson's undoing. The doctor who was in attendance upon him at the last expressed the emphatic opinion that the fact of going on to the field a second time caused Wilson's death - that, in a word, if he had remained in the directors' room he would have had a good chance of getting better. "The actual cause of death was angina pectoris, a medical term which signifies what is more commonly known as heart anguish; and the jury at today's inquest certified that Wilson had died from 'heart failure, from over exertion in a football match'." On the Wednesday morning, City directors and players met at Catherine Grove for a service held by Reverend Mr Price, then went up by train from North Eastern Station to the funeral in Leith. Leeds City paid for the funeral and arranged a benefit match a few weeks later against Hull City for Wilson's widow and their ten-month-old baby girl. It came as a surprise to many who knew him that Wilson was only 23-years-old, having been born in the East of Scotland on July 23, 1883. Most people who saw him would have taken him to be about 30, because of his heavy fair moustache. He was one of three brothers who made their name as footballers in the Army, and this led him to be familiarly known as Soldier Wilson. The Yorkshire Evening Post: "Wilson had had an interesting football career, the story of which he related to the writer only a few months ago. 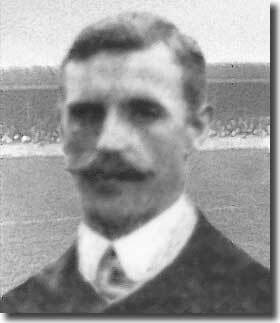 He was a native of Musselburgh, in the county of Midlothian, and in 1896 enlisted in the Cameron Highlanders, with whom he went out to Gibraltar, where he began playing Association football. Whilst at Gibraltar, Wilson transferred to the 1st Battalion Black Watch, which regiment he accompanied to India, and subsequently to South Africa, where, with Colonel Remington's column, he took part in some of the Boer drives. "It was after returning to England that he was bought out of the army by the Dundee Club, for whom for a season or two he played at centre-forward in the Scottish First League. Just two years ago he had his knee badly twisted, and on his recovery he was transferred to the Hearts of Midlothian Club, for whom he rendered yeoman service until joining Hull City. He played at Anlaby Road in two or three matches last season, and then came to Leeds City, the transfer fee paid for him being £150." Many felt that Wilson had lost his form, but City secretary-manager Gilbert Gillies retorted "Those critics did not know Wilson. There were few better centre-forwards in the country." The demise of David Wilson is one of the greatest tragedies in the history of Leeds City, but led directly to the arrival of the club's most celebrated son. On 18 November, the Peacocks paid £350 to Lincoln City to secure the services of Billy McLeod, a centre-forward who was even more productive in front of goal than his predecessor. Over the 14 years that followed, McLeod was to score a phenomenal 171 goals in 289 League games for the club. The contributions of McLeod, however, were a future phenomenon. At the start of November 1906, everyone connected with Elland Road was in a trough of despair at the loss of a trusted and worthy colleague. David Wilson would be sorely missed and his death left a shadow over the club.